I’m going to do something different today: Start with good news items. We need to hear that good news, with all the clouds hanging over us. The first is the matter of Israeli-Japanese relations, which have blossomed astonishingly in the past year. This is true in the areas of diplomatic relations, industrial and scientific technology and trade. On Sunday, Japanese Prime Minister Shinzo Abe arrived here for a three-day visit (which ultimately had to be cut short because of an ISIS hostage situation he had to contend with at home). And it was on Sunday that Prime Minister Netanyahu, referring to the Islamization of Europe, spoke about the need to increase Asian markets. He spoke as well about the “historic opportunity” to join Israeli and Japanese capabilities for mutual benefit. Originally published under the title, "Cosmopolitan UK Mock-up Cover Depicts Suffocating Victim of Honor Killing." Though it will not hit news stands, a mock-up cover released by Cosmo UK is raising awareness about honor killings. The cover is shocking, gruesome, and bold. It features the face of a woman encased in plastic, being smothered to death. A video shows the plastic wrapping being ripped open, "signifying the release of women from violence." Cosmopolitan magazine in the UK has released a mock-up cover of their February issue, designed by Leo Burnett Chase, as part of a campaign to raise awareness about honor killings. The cover is that of a 17-year-old British-Pakistani girl, Shafilea Ahmed, who was suffocated to death by her parents in 2003 for the crime of refusing an arranged marriage. Cosmo has joined Karma Nirvana and the Henry Jackson Society in organizing an "inaugural Day of Memory for Britain's Lost Women, which will take placeJuly 14—the day of Shafilea Ahmed's birthday." Will mainstreaming a critique of honor killing reach those most likely to perpetrate so dishonorable a crime? Are this cover and the planned campaign proof that some Europeans are ready to relinquish the failed doctrine of multi-cultural relativism, appeasement, and the "soft" double standard of racism? Is the British legal system finally ready to do whatever it takes to abolish barbaric cultural practices? Shafilea Ahmed was a young British-Pakistani girl whose only crime was that of becoming too "Western." Her parents allegedly sedated her without her knowledge and packed her off to Pakistan to meet her much older cousin to whom she had been promised in marriage. Shafilea responded by drinking bleach in a failed suicide attempt. She refused the marriage. Her mother, Farzana, was furious that she had "made a scene." It should be, even in our less than perfect world, that international courts were bastions of ethical judgment and impartiality. OK, maybe that’s expecting too much. Shall we say, just institutions that model some degree of ethical judgment and impartiality. But even this is expecting too much in today’s climate of severely distorted perceptions and values. The court I have in mind, of course, is the International Criminal Court, which is just one more corrupt – and politically correct – international body. As today’s JPost editorial has it: the court is unable to “differentiate between good and bad.” Ah, yes. Anti-Semitism is once again emerging from the shadows on US college campuses, in the guise of anti-Zionism. Crossing the Line 2: The New Face of Anti-Semitism on Campus reveals the proliferation of anti-Israel activities and anti-Semitic rhetoric on North American university campuses. The line between fair criticism of Israel and anti-Semitism has been crossed, and we are witnessing increased hatred and violence across North American universities – from biased faculty members, eviction notices, and hostile classroom atmospheres, to national campaigns such as Israel Apartheid Week (IAW) and the Boycott, Divestment and Sanctions (BDS) movement. Crossing the Line 2 educates and empowers students and communities to learn more about current anti-Israel trends and take action. How many times do we have to witness the funerals of innocent Jews cut down in their prime by terrorists? Sadly, a rhetorical question. We’ve already witnessed it too many times. And we know with a reasonable certainty that we are going to witness this yet again. The Islamic world is currently in the midst of a great historic convulsion. This process is giving birth to political trends and movements of a murderously violent nature. These movements offer a supposed escape route from the humiliation felt at the profound societal failure of the Arab and to a slightly lesser extent the broader Muslim world. The escape is by way of the most violent and intolerant historic trends of Islam, into a mythologized and imagined past. The route to this old-new imagined utopia is a bloody one. All who oppose or even slight it must die. 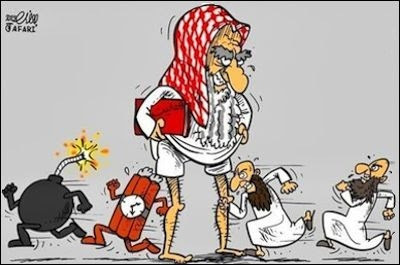 The simple and brutal laws of 7thcentury Muslim Arabia are re-applied, in their literal sense. The events of last week in Paris were a manifestation of this trend.